Home » Neem Oil for the Garden - 16fl. oz. Neem Oil for the Garden - 16fl. oz. Containing only certified organic Neem Oil, cold-pressed from seeds of the Indian Neem Tree, it is environmentally compatible, non-toxic to mammals and birds, and does not affect beneficial insects and bees. Neem Oil makes a biodegradable, safe and effective plant spray and soil drench. This bottle can make up to 24 gallons of solution. Your garden will be safe for immediate use after spraying. Wash fruits and vegetables prior to consumption. 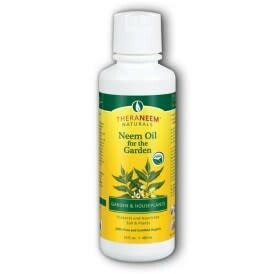 TheraNeem Neem Oil for the Garden may also be used on pets and livestock. Use TheraNeem Neem Oil for the Garden on all vegetation, including houseplants, flowers, roses, fruit trees, shrubs and ornamentals. Directions: Usage rate is one teaspoon Neem Oil per quart or four teaspoons Neem Oil per gallon of water. Add 1 teaspoon of an ecologically friendly dish detergent to a small portion of the water as an emulsifier. Add the Neem Oil and mix well. Add remaining water, stir well and use immediately. For outdoor gardens, we recommend spraying at dusk to allow the oils to soak into the plant and soil. Do not spray in full sun. Use as a foliar spray and soil drench, spraying both the top and underside of the foliage. Repeat spraying once a week for 5 weeks. Contains: 100% Organic Neem Seed Oil.